Update 4/12: after sewing for a couple more years, I realized this little tutorial could use some revisions. If you've made them before and the directions look slightly different, that's why. You will still get the same adorable end result plus slightly better technique. Promise! 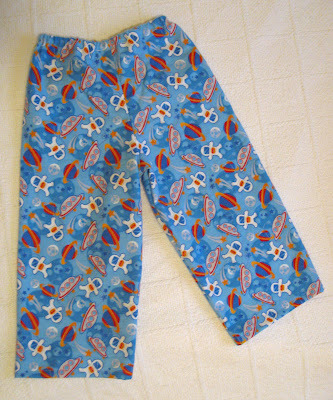 You'll need prewashed fabric (I prefer flannel for this project), elastic, and a pair of kid-approved jammy pants. As with most of my projects, I did this one in the evening while the kids were sleeping. No natural light to make pretty pictures, but they get the job done. First, take your fabric and fold it lengthwise selvage to selvage (right or wrong sides together, it doesn't matter). Then fold the selvages separately back toward the center fold.This is hard to explain and even harder to get a picture of, so here's a sketch...I apologize for the questionable skill. The only thing that's really important is that both your folded edges match up like this. Fold your pattern pants in half and line up the straight side with the folds of your fabric. Trace around the pants adding about 1/2" to the vertical edges. 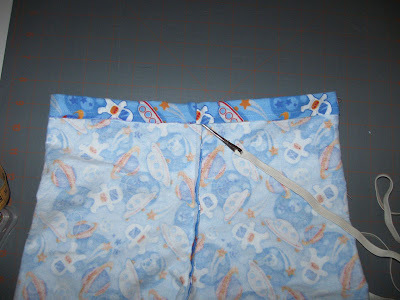 Add about 1 1/2" to the hem and waistband (horizontal) edges. Remember to compensate for the elastic waist in your pattern pants: create a straight vertical line above the curved section and leave your folded edge intact. Look at the next picture where it's been cut to see what I mean. Leave your fabric stacked neatly just as it is. Cut out your pieces. Next lay your cut pieces right sides together like this. This is why I prefer flannel: it sticks together like an old school felt board from Sunday School. No pins necessary. Yeah! Then sew it up along the curved sections (the crotch seams) using an interlock or zigzag stitch, or put it through your serger. Now you'll lay out your pants so they look like the picture below. 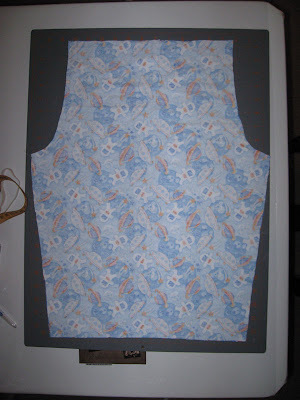 Line up the front center and back center seams so they match and pin the in place. I don't do any other pinning right now. Instead, I just line it up and start sewing at the center seams down one leg seam. Then I put it in the machine at the center seam again and sew down the other leg seam. This keeps your center seam where you want it. Again, use an interlock or zigzag stitch, or put it through your serger. Now it's time to make a casing for your waistband elastic. Fold over the top edge of your pants about 3/4", then 3/4" again, pin and sew all the way around. Leave an opening at the back center seam (they're identical by the way, so just pick one) to insert your elastic. Feed your elastic through and stitch it together at the length you want. Trying your pants on your pint size client is the best way to determine your elastic length. Turn your pants right side out and appreciate how cute they are...but you're not done. I find it easier to sew the hem when the pants are right side out so this is what we'll do next. 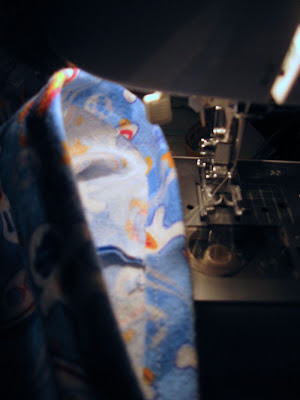 Fold your hems under about 3/4" and then 3/4" again and run them through your machine like so. And NOW you're really done. I promise. Step back and admire your handiwork! Extra Credit: If you just can't stop yourself, whip up a little matching top for your pants using your pants fabric and the fusible stuff used for appliques. 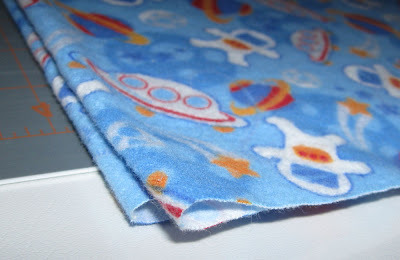 Super easy and flannel makes nice velvety soft appliques. If you use this tutorial I'd love to see your creation! Feel free to post it to the Handmade Mommy Tutorials Flickr Pool. just found your blog thru one pretty thing, and i am in love! and i love your new hair colour! very chic! thanks for the tut. I just bought fabric last night to do this very thing for my kids for christmas!! Thanks for all the kind words! Have fun sewing and I'd love to see the fruits of your labors. wow---that is so cool! and looks so easy even for a beginner sewer like myself. i have had make pj bottoms on my to-do list for my 11 yr old and now i can! I know you don't know me... but you just saved my life. I need to make some jammy pants to go with my sons Halloween costume and the stores were all out of patterns. Thank you for posting this! Awesome tutorial! I'm going to whip up a pair for my daughter this weekend. I've never sewn clothing before, but this looks easy enough for me to try. Thank you for posting this! i dont think i will ever buy jammie pants again..>Thanks for sharing!! Sew cute! Bookmarking! Thank you for making the tute! Thanks for the tutorial. I was given a pair of p.j. pants that I couldn't fit and have been brainstorming what I could re-purpose them into. It wasn't until I read your post that I thought to re-purpose them into p.j. 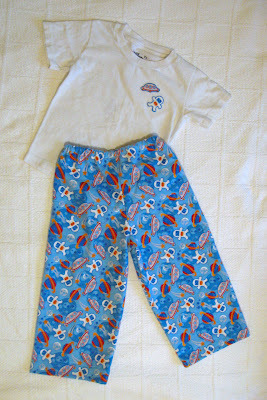 pants for my daughter :) Thanks again... and a link to MY post! Love this! 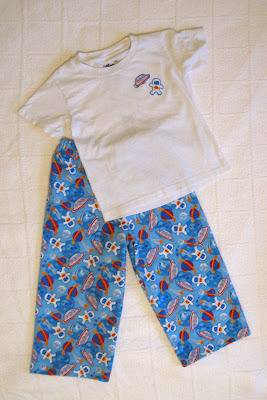 I can picture cotton jammie pants for summer and flannel for winter - how cute! Thanks for posting this! It was a lifesaver for me! My 2 year old just broke her leg and had no pajama pants that fit over the cast. Thanks to your speedy shortcut, I was able to make her a pair super quick. Your instructions worked great! I made some for my daughters for Christmas! They turned out so well. Thank you. I blogged about it and linked to you. I finally made these today!! I bought a really cute flannel sheet at Savers today for only $4 and I made 2 pairs of these in about 30 minutes. My girls love them and I even have enough flannel leftover to make a pair for me too. Awesome, thanks!! I am so glad you all have enjoyed the tutorial and love hearing that it has been fun for others! Seeing your finished pants has been great! Oh i just discovered your blog today! I am so upset I passed up the cutest piece of flannel from joannes today... it would have made awesome pajama pants! I am bookmarking this for later! so, so, smart!! I just bought a pattern today and now I am thinking I should just take it back!!! Brilliant idea!! Nice tutorial. 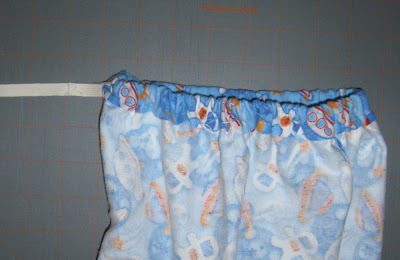 I would hem the bottoms first, and turn over more than 1/2" for the casing. Love these! I can't wait to make them for my little guys! I can't say thank you enough for posting this tutorial. I just made my 1 month old a pair of christmas pj pants and they are so cute on him. I put a link in my blog back to your website. I know I will be making many more in the future. I made a pair for my daughter and son in the last two nights- I never sew, but these were so easy! If you make pants for adults, do you still fold the fabric the same? uhg!!!! getting frustrated. i have tried to make a pair but not succeeding. i don't have any flannel so i used a pillowcase instead. cut it open so i could start it as if i bought some material. that so did not work for me. maybe i think i am beter than i am because this is upossed to be simple!!! help!! any suggestions??? I needed a birthday gift for a little boy and this worked perfect. I also made a matching pillow. Thanks for the easy directions. I'm a new clothes sewer and I just made these SO fast! Thank YOU!!! Gotta question... Could I use really skinny elastic for the waist? My thick elastic is running out fast, and I have loads of small elastic-which is HALF A CENTIMETRE wide. Thank you!! You could totally use skinny elastic. I would just make sure it's loose enough to still be comfy for those little hips. Good luck! 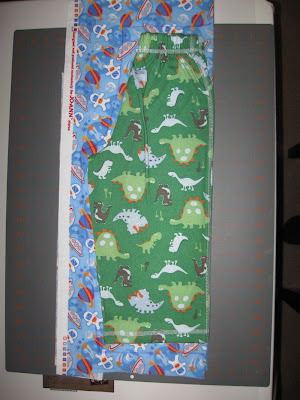 I have sewn pj's similar before but I LOVED how you folded the fabric to just make one cut and then they match up exactly when you sew. I have a tendency to not cut straight and makes things complicated but I just whipped up 2 pairs for my daughters in 45 minutes (my 5 year old helped sew hers and did the elastic herself so it took a few minutes extra) You just made 2 little girls very happy!!! Thanks for sharing!!! Thanks for the pattern!! I just whipped up two pairs of jammies and they turned out great. Going to have to try to make the matching t shirts next! Just made a pair of these!!! So easy , so fast, so wonderful!! Just made my 5 year old very happy thank you thank you!!! Easy peasy with this tute! wonderful! it took me 10 min. to sew with my searcher,ironing for the blind seams and all, and another 3 for the elastic. Thanks a million!! I can't thank you enough for these awesome and simple instructions!! I just made my first ever project on my never used sewing machine and I feel like Queen of the World!!! THANK YOU!!! Flannel was 60% off + 25% off at Joann's today (gotta love that place! ), so I let my 2.5 year old pick out some fabric. A quick google search pulled up this tute. Super easy - took me about an hour on a reg. sewing machine WITH said toddler "helping". Probably would have been a 20 min or less job on my own. He is so proud of his new pants and so am I, so I'll be making more! Just wish I had a serger. 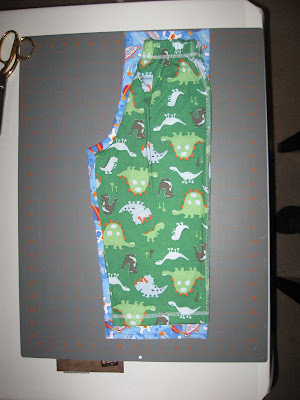 :) They cost about $1.50 with the sale fabric and I was able to make a waistband that fit my skinny kid. Thanks for a great tutorial! 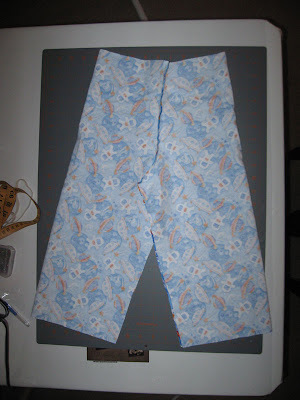 Going to use this pattern for a pair of white beach pants. I don't have a fabric store in my town so I bought a 200 thread count twin white flat sheet to use. This was amazing! I have sewed for many years, always using patterns. Lately I have been wanting to do things on my own, be more creative. When using patterns, clothes never seem to fit quite right anyway. Using your instructions, I made "jammies" for my 2 granddaughters, with their help of course and it was so easy and they were able to understand each step and they love their "jammies". Thanks so much for this incredible tutorial! Terrific project! Absolutely love how this can take 15 minutes and I think all of the sewing enthusiasts at AllFreeSewing.com would agree. Thank you so much for sharing! When you make the applique on the t-shirt, do you have to sew around it? May be a dumb question, but I'm new at this. I find it a little hard to see if you left 1/2 inch on the vertical edge of the folded side. Also, would it work ok to hem the legs while you have the pants flat? I think I might have better luck with that. These are really cute and look easy enough even for me to do. Thanks so much for sharing! Now, let me start with, I've only sewn 2 reversible totes and a pillow (I just got my sewing machine for Christmas). I just made these tonight and my son LOVED them!!! (He's not over critical of me, thank goodness!) I thought your directions were easy to follow (especially for a novice like me). I had a few problems with the waist--not the folding over the seam or adding the elastic--that I could do without difficulty. They just ended up being snug. It's definitely more my sewing skills than your directions. I do know that I'm going to try again with my remaining fabric. I'm just glad that my son was able to wear them to bed tonight. Thank you!!! I'm glad I found a way to make some jammy pants the "easy" way. Who Loves Handmade? We Do! You've heard it all before, but it could bear repeating...All tutorials are for personal use only. All images and text are property of me. Please ask permission before you use content - I'm sure I'll say yes anyway.